Lord Alfred Tennyson (1809-1892) is arguably one of the most frequently quoted writers in English literature after William Shakespeare. Who hasn't heard the phrases 'nature, red in tooth and claw', 'Tis better to have loved and lost, Than never to have loved at all' and 'Their's is not to reason why, Their's is but to do and die'. 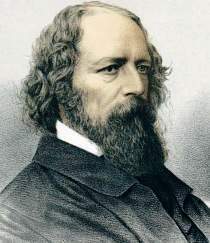 Tennyson was born in Somersby, Lincolnshire and is considered one of the most popular English poets. He is often regarded as the chief representative of the Victorian age in poetry and in 1850 succeeded William Wordsworth as Poet Laureate. In view of the many battles going on in the world today, I've chosen Lord Alfred Tennyson's The Charge of the Light Brigade as a poem to be reflected upon. Although critics have never considered it to be one of Tennyson's greatest works, The Charge of the Light Brigade, has remained one of his best-known and probably one of the most famous war poems of all time. It immortalizes a British battle in the Crimean War against the Russians. After reading about "some hideous blunder" in the newspaper that reported forty percent of the soldiers in the Light Brigade were wounded or killed because of a confusing mistake, Tennyson decided to write the poem. It proved to be an inspiration for British soldiers fighting in the war. It's most moving aspect was the glorification of the noble soldiers who followed the ill conceived, fateful orders that they were given, while capturing the noble sense of duty to one's superiors and honor in battle.